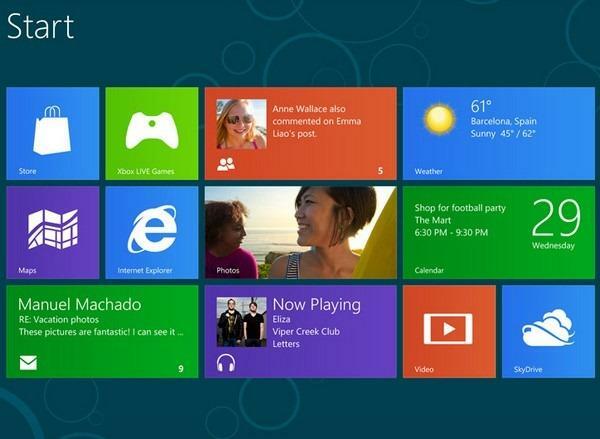 Initial sales of the Windows 8 operating system are said to be "well below" Microsoft's internal projections. Citing a "trusted" source, Paul Thurott of Supersite for Windows said Windows 8 is off to a weak start, but Microsoft doesn't believe sales have been affected by the software itself. Instead, the thinking in Redmond, Wash., is said to be that PC makers have offered "lackluster" designs, along with limited availability. That disappointment with Microsoft's PC partners is said to have further reaffirmed the company's strategy with the new Surface tablet, which is the first computer designed and manufactured by the company itself. Thurott surmises that the initial disappointment of Windows 8 is related to a number of issues, including a slumping economy, confusing range of device types, and the touch-centric interface of Windows 8 Metro. "The net effect of all this stuff, I think, contributes to a wait-and-see approach with Windows 8," he said. "And that is exactly the opposite of what Microsoft and even the broader industry should want at this time." Word of disappointing Windows 8 sales came after it was announced that the head of the project, Steven Sinofsky, was leaving the company. Reports have said he was ousted by Microsoft Chief Executive Steve Ballmer, who allegedly had the backing of company co-founder and former CEO Bill Gates. Sinofsky's departure has been compared to the recent purported firing of Scott Forstall from Apple. Forstall was in charge of Apple's flagship iOS operating system found on the iPhone and iPad, but also oversaw the transition to iOS 6 and Apple's new Maps application, which was regarded as a disappointment.